WHY THIS PROCESS TRIGGERS CREATIVITY. There are amazing treasures in your soul. It connects you with your Inner compass. Using images that jump out at you from magazines, your unconscious mind combines them to reveal the amazing treasures in your soul. It takes courage to see beyond thoughts and words often hidden by habit. Your truest voice and inspiration are revealed when you step into creative flow. Join Nan Lund for lighthearted fun as we create Soul Cards. The process triggers creativity in art, career, health, and relationships. It helps to catch all the inner wisdom that you don’t know you have. It is science but feels like magic when ideas come into focus, AHA moments appear and projects blossom. Use the collage cards intuitively to answer questions and participate in self-discovery. Joyfully deepen understanding of the relationships between your personality parts, your family/community/world, your dreams, symbols, and spirit. Based on the SoulCollage® process originated by Seena Frost, these cards are for personal use only and are not for sale or barter. The images borrowed from magazines are held with great respect and gratitude. Learn how to harvest images that call to you from a part of you that is usually veiled. Make your own incredible deck of cards – each collage card representing one aspect of personality or Soul. Discover how to read your personal cards that speak from your inner wisdom. Contact NanLund@aol.com to register for sessions held the first Sunday of each month 2:30 to 5:00 pm at 40West. $10. per session or $25. for a 3 session punch card. All supplies are included. Scholarships available—just ask. I provide all supplies but if you want to buy your own, Joann's Craft store and office supply stores both carry the Repositionalble Glue sticks. Joann's also carries letter size cardstock in small amounts. Office supply stores and Expedex sell cardstock in large packages of 250. I buy the plastic sleeves from clearbags.com but smallest order is 100 for $8.00 plus shipping of $16. Meiningers does not have this size PR58 Premium bag. Seena Frost's website soulcollage.com sells cards and sleeves but they are smaller 5"x7". Nan Lund’s passion for art started at age 5. She has continued exploring juicy and vibrant media to express her awe of this amazing universe ever since. Joyous living in creativity brings her to sharing this process. Her art has been exhibited in numerous, shows, galleries and museums. Nan holds a Bachelor of Arts Education from the Art Institute of Chicago. Her Lakewood graphic and web design studio reflects her vision. Her pursuits also include Plein Aire watercolor, travel and music. A way to tap Inner Wisdom. 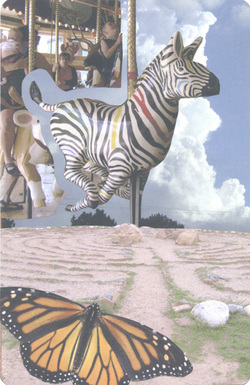 SoulCollage® is a creative and satisfying collage process. You make your own deck of cards - each collage card representing one aspect of your personality or Soul. Use the collage cards intuitively to answer life’s questions and participate in self-discovery. Joyfully deepen your understanding of the relationships between your personality parts, you and your family/community/world, and you and your dreams, symbols, and Spirit. Visit originator of the process Seena B. Frost at www.soulcollage.com.